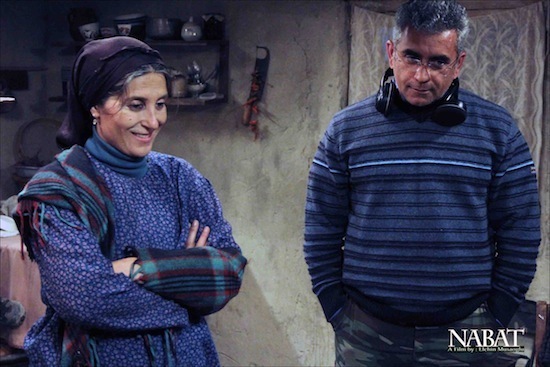 In his director's statement for Nabat, Azerbaijani filmmaker Elchin Musaoglu wrote "I sincerely feel that if more power were given to mothers, the world would be a better place." His film premiered in the Orizzonti section of the Venice Film Festival this past week and stars the legendary Iranian actress Fatemeh Motamed Arya, in a powerful, nearly solitary performance. A one-mother show, so to speak. The story of Nabat is about much more than what we're told on the big screen. It's the story of all mothers, of all women who long for a place, and simply cannot let go of it. While the film deals with one particular woman, a mother who, at the height of the war that engulfed the region when the USSR fell apart, cannot tear herself away from her village in Azerbaijan, now a virtual ghost town, the story could be about today, and a Syrian refugee or an Iraqi Christian. Anyone, anywhere around the world, really, because at this point in time we're all becoming casualties, physical or psychological, of wars. Nabat's own ghosts have to do with the loss of her son, in the war. But being neither a mother, nor a villager in Azerbaijan, I personally connected deeply with the woman that she is. Her resolve, her humanity, her vulnerable strength tore at my heart, and the film made me think about her for days after I first watched it. Still today, there are haunting, slow changing images of Nabat walking through the barren countryside that have left in me a sense of melancholy. If only Musaoglu's statement were true, mothers could make great leaders. I know mine would. I caught up with the filmmaker and his star in Venice, at the coffee shop inside the Excelsior Hotel. To my amazement, they communicated in Turkish/Azeri, which Motamed Arya moved comfortably in and out of, translating Musaoglu's answers for my benefit. It was an interview both wondrous and surreal. I felt lucky to be in the presence of these magnificent talents, but also such extraordinary human beings. Do you think you can explain Azerbaijan to the world, through your film? Elchin Musaoglu: I don't know how to explain it to the world, I just know that I made a movie about a mother of the land. Of course, this mother is my personal experience, in my land, but in my mind she's not just that, she's a universal mother. So this is my mother in my land, but it could be the whole world. Do you feel a social responsibility to explain the soul of your country, as you have in this film? Elchin Musaoglu: During the war I heard a lot of subjects. The most important subjects I found during the war, this was throughout many villages, all the people would leave, but only the mothers stayed behind. It wasn't just one, but many villages, where the mothers alone would not be able to move and leave. Even some members of my family did that. And I thought that this subject would make sense to others around the world. Yes, because it explains the humanity. Fatemeh Motamed Arya: Oh, it is such a beautiful word that you are saying! It's not only about the war, or about a specific country, but about the human aspect, right? Elchin Musaoglu: I really didn't like to talk about the war, I wanted to talk about after the war, what happened for us, as a people. When I watched the film, I didn't think about the war, only about this woman and how she touches me. And her survival. You give us only hints of the war. Elchin Musaoglu: Thank you very much for something that you catch from the movie. It was my intention not to show the material of war, but have the audience feel it's a war. You're way too young to be a legend, but you are, and a very modern woman in every sense of the word. How do you interpret a character that is so far removed from you physically, older, but also much more rural? Fatemeh Motamed Arya: I've played in more than 54 movies. And it's not easy to confess that I was fourteen when I first started working, so I've grown up with my job. It's just acting, I've never done anything more, made a few documentaries but I've spent all of my time, not most of it, all my life on my work. So it's easy to find within me different people from different parts of the world, how they can talk, how they can sit. This is my job, it's not difficult for me to find a personal place of knowing who is she, where is she, what she wants, that's it. What was your first thought on being approached for the role, and how did you find Nabat within you? Fatemeh Motamed Arya: For all my work, I first just read the script. If the script catches my mind, I will say yes. Then I think about how to play on it, as a role, but the script is very important for me. If the script is something that I believe, it's about human rights, about women, about war, about violence, which are problems of life now, that I can transform to the beauty of life, I try to do that. People need, all the time, love and beauty in life. I always try this, with all the different subjects. Also I try to play men's roles, it's not important which gender. Now for example I'm looking for a good director who can direct me in King Lear, and I'll play Lear. I'm not so old, but experience in my work is a lot. So now I cannot just be on my level. I want to go to the next level. It's possible for an actor or an actress to play differently, it's important that each role touches your heart. And for me now it's mostly women, which I play. But sometimes it's a man. For example King Lear is a special character I'd really like to work on. What is the one quality about King Lear that really attracts you? Fatemeh Motamed Arya: I think everyone has a bit of King Lear in their heart. Or more importantly, their mind. Nobody can hear others criticizing them. Everybody wants to know only those who talk better about them, this is what I'm thinking about. Everyone wants flattery these days. Fatemeh Motamed Arya: When I was a child I really liked playing Cordelia. Now I think that Cordelia is small, I need to be Lear. How did you find your actress? Elchin Musaoglu: I was looking for an actress from Turkey, Azerbaijan, Tajikistan, etc.. My cinematographer is Iranian and knew Fatemeh for a long time, as an Iranian actress, and he told me it would be impossible to work with a woman in the same age as Nabat. That I should look for a younger actress, who will be able to do what I need in the movie. And he introduced Fatemeh to me. I went to Iran, watched some of her movies, she played as a very old woman in Gilaneh. And when I saw her, so much younger than the role, I said no, it's impossible to work with her. I didn't think she could be a villager woman. Then we started to talk, went to the countryside with the DoP, talked, and after that I said yes, I think she is the only person who can do this. Was it difficult for you, a Farsi speaker, to learn the language of Nabat? Fatemeh Motamed Arya: I didn't know Azeri before. I read the script in English, and I told him I never worked on a film where they had to dub my voice, so I'll have to do my own dubbing if you want. And he said OK, I wish so too, but if you cannot speak it I'll have to dub it and I said never do that, I'll die! So I tried to learn the language there, line by line, and we fought sometimes. About one word. And I tried to speak Azeri, but the Azeri that I'm speaking it's really not the same that they are speaking in Baku, for example. But I can be a villager. Also with silence, he tried to explain to me the role of Nabat. I cried once after the shooting because it was so difficult of me. We repeated one shot twenty times, in the rain. We had no way to communicate, I could not say anything to him. It taught me how I have to wait for something and how much I have to try for something I like. So I learned the Azeri language, I had a teacher in Tehran every week to learn to talk Azeri. I'm sure I'm not perfect, but I can pass. You deal with the theme of war, and yet it's never really seen in the film. Why did you make that choice? Elchin Musaoglu: About the war, we don't like to say something by shouting, and make news about the war. We want to talk about the war by whispering. Our weapon in this world is our work. If one person understands what I'm talking about in life, with my work, it's enough. One person who understand how to stop war is enough. The power of one person. Images courtesy of The PR Factory, used with permission.